Heavy Duty Mini Air Compressor - 1/5 Hp With Tank Discounts Apply ! 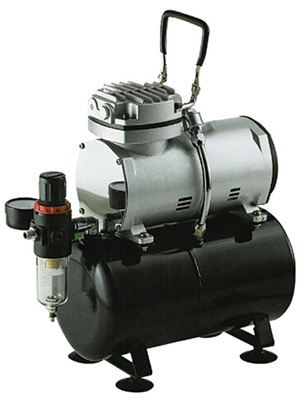 MXT186 - Heavy Duty Mini Air Compressor - 1/5 Hp With Tank, Filter and Regulator. 1/5HP AIR COMPRESSOR WITH TANK, FILTER & REGULATOR State-of-the-art single cylinder, oil-less piston type compressor features 3-liter air tank, pressure regulator, air filter and carrying handle. The powerful 1/5HP thermally protected motor starts at 30PSI and stops at 60PSI. A safety valve automatically releases air pressure when it reaches maximum levels. Air output is a constant 23 liters per minute with no vibration. Heavy cast iron housing with protective rubber feet. Compact 12" x 5" x 12" size. 110V/60Hz.